Opening wide range of professional opportunities and rendering global perspective. GNA University signs MoU with TimesPro, between TimesPro, an education initiative of the Times of India group. GNA University Students Attended National Seminar on "Computational Fluid Dynamics and its Applications"
GNA University celebrated "The Integrity Day"
Rediscover yourself, become a response citizen. Faculty of Engineering and Technology had organized one day workshop on “Internal Combustion Engine and Automobile Systems” on February 02, 2018. 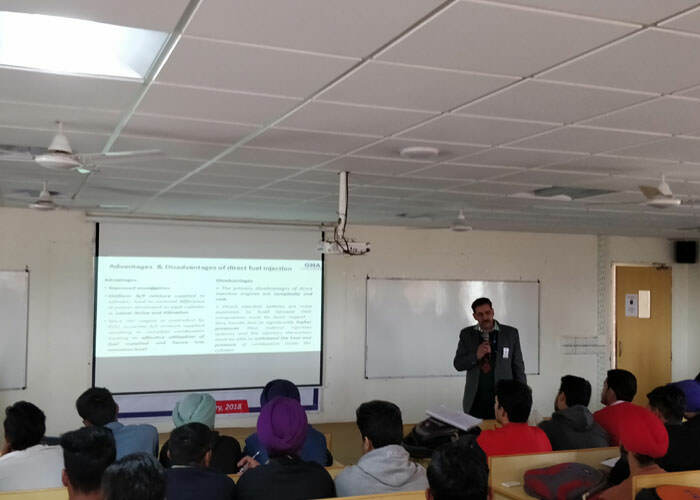 Workshop on “Web Development Using PhP"
JCI Phagwara GNA organised a Workshop on "Effective Public Speaking"
CAMPUS PLACEMENT DRIVE @ GU BY RALSON INDIA LTD. Faculty Members of FDI gets three days hands-on training on Fluid Sim, CIROS and PLC Programming by the technical experts from FESTO. GNA University’s MBA Placements – Get a step forward to the corporate World! GNA University Signs MoU with Tally Education Pvt. Ltd.
Industrial Visit to Eastman Industries Ltd, Ludhiana. Students of B.Tech ( CSE) and B.Sc. (DMSN) students of Faculty of Computational Science attended the expert lecture entitled “Role of Cyber Security in Digital World” at GNA University . Faculty of Film, Television and Media, GNA University, organized celebrations for “World Photography Day” at the GU Campus for creating awareness among students about importance of the day. Faculty of Hospitality, GNA University organized a guest lecture on operational aspects of Cruise lines for the students of B.Sc. Hotel Management. A two days programme is conducted by Huawei Network Academy in GNA University. This program is focused on wireless technology, Datacom, OTN frame structure and cloud computing technology. Mango lovers in the town got a treat at Dawat_E_Aam – The Mango Food Festival organized by the Faculty of Hospitality at GNA University. The festival was graced by the auspicious presence of S.
Faculty of Computational Science, GNA University organized 2ndNational Conference on ‘Advances in Computer Science’. Industrial Visit to INDO FARM Equipment Limited, Baddi, Himachal Pradesh. On 28 Feb 2017, National Science Day was celebrated by Faculty of Natural Sciences. GNA University another proud moment for the GU family. GNA University signs MOU with ValeurHR to create an exclusive platform for our students. Recently GNA Business School oraganised a workshop for the students of MBA-3rd Semester on “Walk Towards a Bright Future. Video Resume Concept” by DayZero Pvt. Ltd. New Delhi. GNA University organized a Punjab Spell Bee Championship – the first ever of its kind in Punjab. Marie Curie Week Visit to Ralson India Ltd.
Students of B.Tech-CSE(5th Semester), MCA (1st and 3rd Semester) and M.Sc- Software Development (1st and 3rd Semester) visited Huawei Telecommunication Pvt. Ltd., Gurugram and India Gate New Delhi. Group Discussion on “Engineer can be a good Economist. Faculty of Business Studies organised a guest lecture on ” Labour Laws & Its Application” . The lecture was delivered to MBA-1st Semester and BCom-IIIrd Semester on September 19,2016. by Mr. V.K. The Faculty of Business Studies at GU organised a guest lecture on “How to crack an Interview” by Mr. Maheshweri Peri ( Chairman & Founder of CAREERS 360, The Education Hub) on September 15,2016. 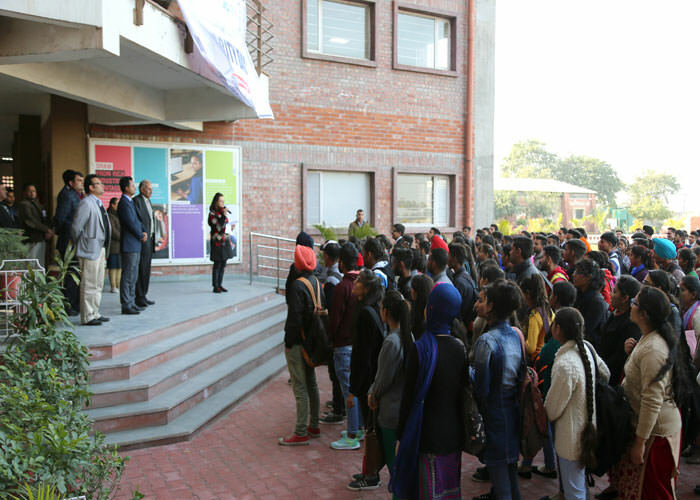 Visit of Sr. Management Team of New Holland Fiat India Pvt Ltd.
GNA University, Phagwara celebrated 68th Republic Day to mark the anniversary of the adoption of the country’s constitution in 1950.